Intricate green stained glass leaves lace the rose and white scalloped shade. This lamp is placed on a metal base with bronze finish. Shades: Textured blue stain glass with scalloped design. Operates with two pull chains. Number of lights: Two (2). Requires two (2) 60-watt bulbs (not included). Dimensions: 25 inches high x 16 inches wide. 25in H X 16 in W. Please read product descriptions very thoroughly. 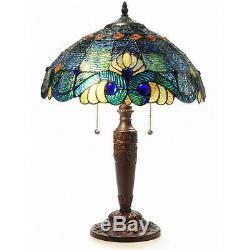 The item "Blue Jeweled 25H Table Lamp Stained Glass Art Light Lamps NEW" is in sale since Tuesday, February 27, 2018. This item is in the category "Collectibles\Lamps, Lighting\Lamps\ Electric\Table Lamps".